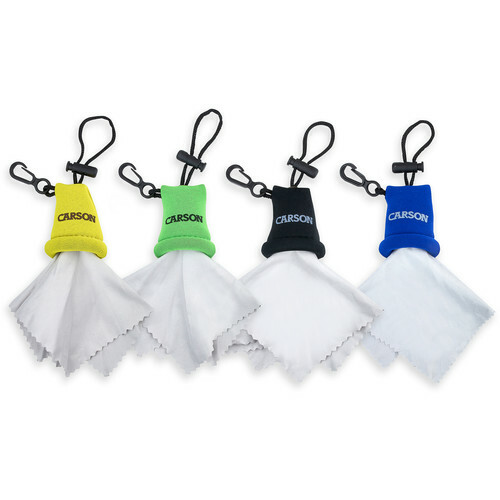 This Stuff-it Microfiber Cloth with drawstring in green, yellow, black, and blue 4-pack from Carson is a handy little accessory that can be thrown into your gear bag or clipped to your jacket. Remove the super-soft microfiber cloth from its protective pouch and use it to clean camera lenses, telescopes, spotting scopes, eyeglasses, and other valuable optics. It is a safe and convenient way to remove lint, dust, dirt, and fingerprints from your valuable optics. When you are finished cleaning, pulling the drawstring will retract the cloth back into the pouch. Box Dimensions (LxWxH) 13.9 x 9.85 x 1.75"
Stuff-it Microfiber Cloth with Drawstring (Green, Yellow, Black & Blue) is rated 4.3 out of 5 by 133. Rated 1 out of 5 by GA shooter from Nearly Useless Product For years I have used a similar product by a different manufacturer and made the classic mistake of being lured by a cheap price. Unfortunately, this microfiber cloth is attached to the mini pouch in the middle, not on one end. This means you have a very small piece of cloth to actually clean with and you can't reach the lens with this clipped on the strap. Rated 5 out of 5 by Noornashriq from What a brilliant design Ive been wearing spectacles since forever. And the one thing that annoys me often is that I cant seem to find a proper cloth whenever I need to wipe my glasses. I always end up using the end of my shirt which eventually will leave scratches by the end of the year (I always order my glasses with anti-scratch coating). With this I could just clip it on my bag and leave it there. I know the cloth wont get dirty because its secured inside its pouch. Now, every where I go I have a proper cloth to wipe my glasses. I would probably buy a few more of this so that I can have it on my other bags and on my keychain too. Rated 5 out of 5 by Daniel F from Awesome Little Cloth This cloth works well. Just like other microfibers but this one tucks away in its own little pouch. Perfect to keep in your backpack and doesn't get in the way. Rated 2 out of 5 by David from good idea, executed poorly The surface area of the cloth is small and the cord attached to the center of it exacerbates that problem while making it hard to grasp. Does not retract fully, leaving about half the cloth out to be stuff into the housing by hand. Still requires two hands to deploy and retract. Looks like a good idea but executed poorly; in my opinion, more of a gimmick. Rated 5 out of 5 by Videographer & Photographer Boone from small item, but big bang for your buck ! I am a professional photographer and videographer. Since I am always on the go, and in many situations dust, moisture, etc. I need a good lens wipe that is small, affordable and of course functional. It does it all. I love the compact design and how it tucks away to keep itself clean. I love that! When I was looking for a sturdy and functional microfiber cloth...I said THATS IT, That is THE ONE! You guys rock! Anytime I need something B&H is always there for all of my photo and video and of course audio needs. THANKS B&H !!! Rated 2 out of 5 by Daniel from Would reconsider... The product is actually incredibly small, which is convenient to attach on any bag. One of the drawbacks I find with the product is having to fiddle around to unravel it and vice-versa. I think it introduces more dust and dirt to the cloth. I'd rather stick to larger clothes for that sole reason. Rated 5 out of 5 by Charlie from A cloth by any other name... Simple: microfiber cloth with convenient built-in storage. Well worth the $3-5 they cost (prices vary by color). For the reviewers complaining that they have to stuff the cloth back in to the pouch- the product is called the Stuff-it, there should be no surprises there!